The village idiot sneaks in to the picture. Guessed which one it is? 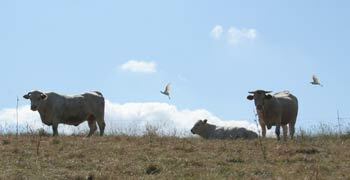 White cattle egrets are here all year round now. ...and some lighting for the boules court, of course. 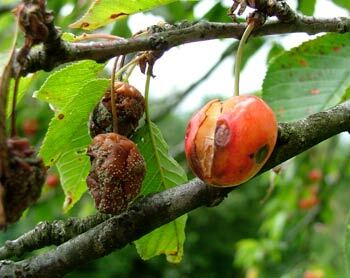 The wet Summer rotted the cherries on one tree and turned the aubergine and pepper plants into a pulp. 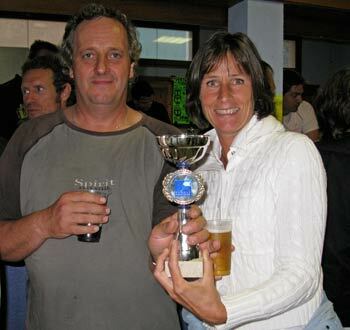 A very happy Caroline shares the glory after she and Francis won the boules doubles competition in Sadournin. 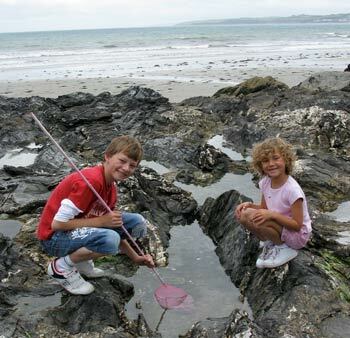 A few days after the party, Perry flew over to Cornwall to stay at his mum's for a week. Thinking he would have a few quiet days before the rest turned up, he was pounced upon by his sister and two children as he was being given a tour of the house. So it was full on from the word go. 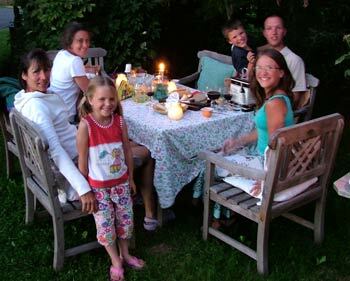 Unfortunately the rest of the family couldn't make it for one reason or another, so they celebrated quietly with a dinner and Perry's mum made a delicious birthday cake. Perry also got to meet the new addition to his mum's family, a beautiful golden retriever puppy, called Barley. The weather was pretty awful all week, with just a few hours of sun between the showers. But they made the most of it by cycling, playing table tennis and braving the winds across the beach. Still, Perry got his Cornish pasty, cream tea and beer fix to keep him happy for a while. Meanwhile Caroline was enjoying her time at home with ther parents staying on for another week. 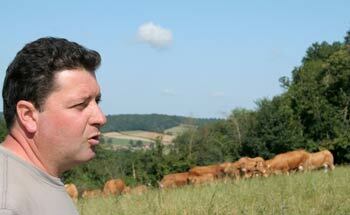 One day, they visited our friend Christian in Lalanne-Trie, to see his farm and cattle. 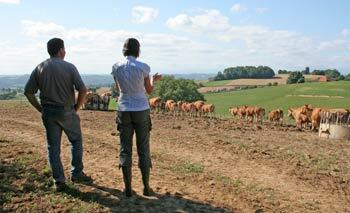 He explained how he breeds and cares for his cattle each day. Animals take all his time, so his idea of a holiday is to take his shotgun and go hunting. 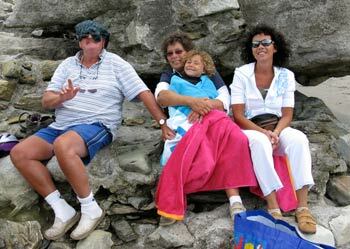 Caroline's cousins Philip and Judith were on a camper tour of southern France and Spain and asked if they could pop by, on the way home to Holland. A short stop-over for tea turned into dinner and them staying over. The camper van parked under the oaks at the end of the lane. Never having been here, they loved looking around the place and trying to place it all after having read and seen the photos on this diary site. 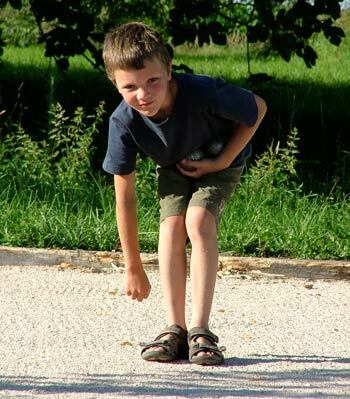 The evening sun invited us all to have a game of boules and being the game that it is, everybody could have a go. 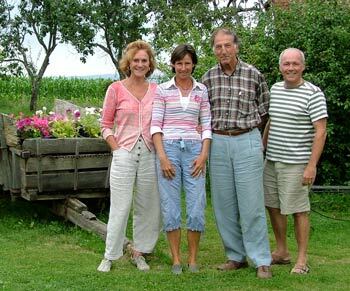 The next day they drove up to the Charente-Maritime and stayed at Philip's sister's new chambres d'hotes for the night. This is a fine stopover if you are ever coming our way and like to break up the journey. Read more on their website. We were honoured to be invited by the old owner of our house, Maryse Montégut, to her 70th birthday party in her village salle de fêtes. It was also to celebrate her daughter's 40th and her grandson's 10th birthday. Maryse's daughter thought it was to be an intimate family meal and was shocked to discover a large group of family and friends all waiting for her. We had to leave a little early to meet up with Caroline's uncle and aunt who were passing through Gascony, but it was a very funny afternoon and a great lunch. That evening we made it back to go to the salles de fêtes in Puydarrieux where they were holding a lamb grill evening. The customary hour or so of apératifs gets the party well lubricated before sitting down. Served by the youth of the village, there is so much meat passing by, it isn't an event for vegetarians. In fact none of the eating events here are meat free and few offer any alternatives. The pond we had dug out now holds water so we needed electricity to power the pump that would irrigate the vegetable garden. At the same time, we thought to extend the cable to get lighting for the boules court. 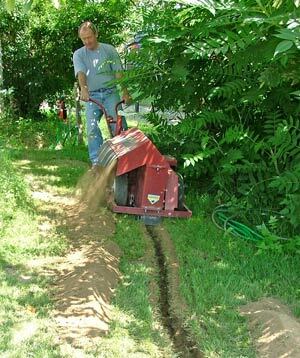 Our friend Ian came over with a nifty little machine which digs trenches for cables and water pipes. 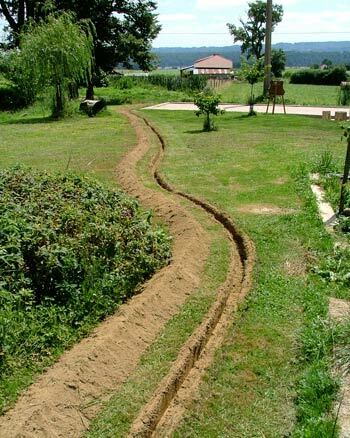 Within an hour and a half he had created the trenches between the two barns and all the way down to the court at the bottom of the garden. The next day we laid the red gain piping for the electrician to pass his cables. Within a few days we were all connected up. After a lot of deliberation and asking around, we have come upon the best way to place lights over the court. We'll use a 6 metre long irrigation pipe - the sort used in the maize fields - place it over a snug fitting base pipe which we'll bury in concrete and weld a T shape across the top for the two lamps. That's the theory at least. We're sure it'll change again before it's all in place. We'll keep you posted on the progress. We received a phone call from someone who had seen a poster in Mirande. "great illustration", he said. We knew nothing about it. Driving around, we found the poster at several locations and indeed, it was indeed my illustration of the arch in the tower entrance to Tillac, a medieval village in the Gers. It is illegal to use an artist's work without their permission. The printer, whom we know well, said that the Mayor of Tillac informed them that he had permission from us and so they printed it. Off to the Mairie with a letter in French setting out the situation and some options to set things right. It turns out that the old Mayor had already been using Perry's image for his business card for two years, having taken it from a set of postcards we had had printed. 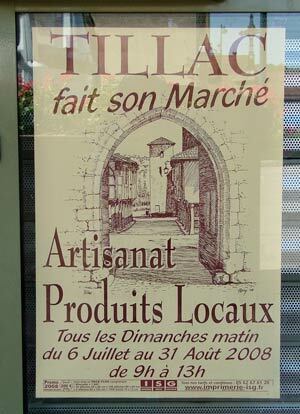 The result is that the Mairie of Tillac have offered to pay a sum for the usage of the illustration. We have decided to agree to their offer, but have asked the printer not to reproduce Perry's work in future, without seeing a signed, written permission. 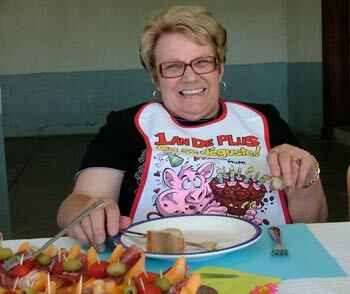 Towards the end of July, we were invited by our friend Michel, to the village repas in Sadournin. Apératifs and lots of foie gras, jambon, duck and wine later, we all wandered out to the boules terrain and Caroline hooked up with Francis, who is a dab hand at the game. Several rounds saw the two of them in the final as the light began to fade. They came away with the cup and two big smiles. Perry was very proud of her. Needless to say this deserved a celebration and the beers flowed well into the evening.